Emperor Meiji funeral hearse. 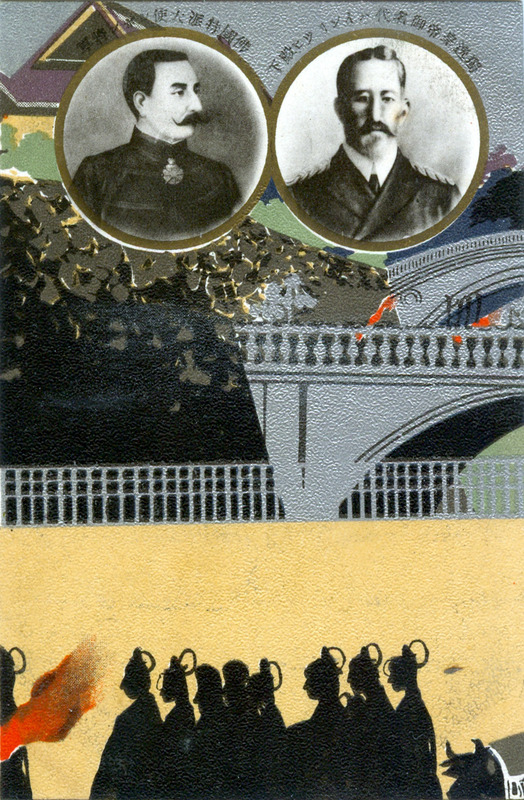 Postcard dated 9 Dec 1912. 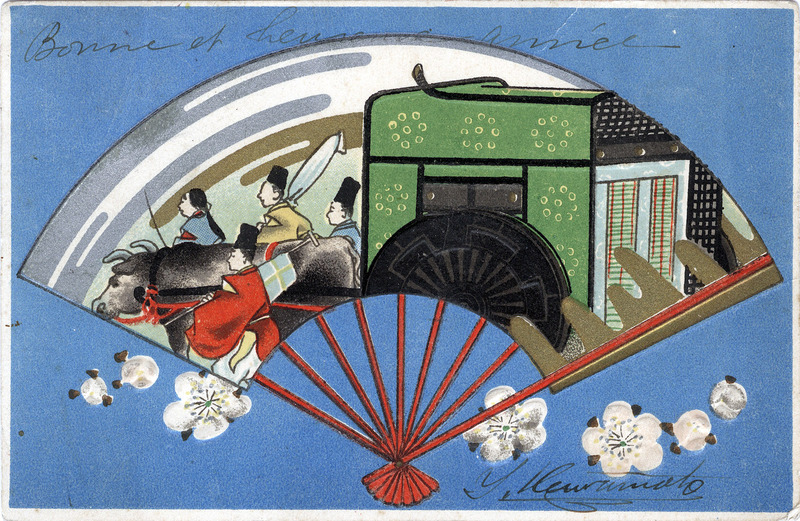 Meiji ox-drawn funeral hearse New Year’s postcard, 1913 (coincidentally the Year of the Ox). “On the night of 13 September 1912, the funeral procession for Emperor Meiji left the palace grounds. “Born in 1852, the year before the Perry Expedition’s first visit, the emperor had ascended the throne in 1867 and presided over an era of unprecedented change. 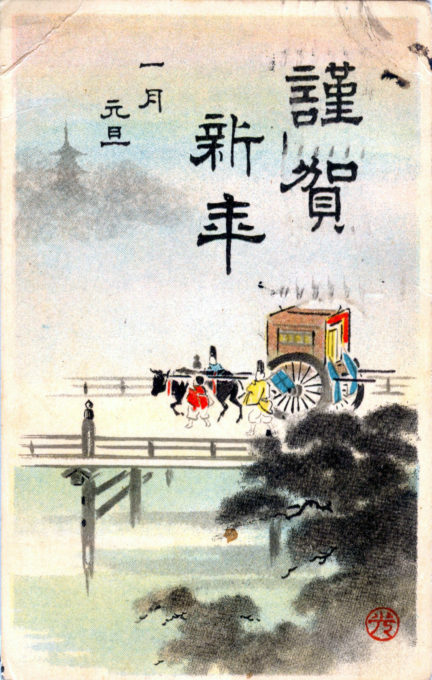 “As his funeral cortege made its way through the streets of Tokyo, the black lacquer wheels of his ox-drawn cart reflected both the glow of torches and the glare of arc lights. Crowds of mourners lined the three-mile route and watch silently as thousands of courtiers, officials, military guards, and Shinto priests accompanied the imperial casket. Cannons thundered and temple bells tolled in salute. Left: King Albert I, of Belgium. Right: King George V, of Great Britain. Top: Emperor Taisho and Empress Teimei. 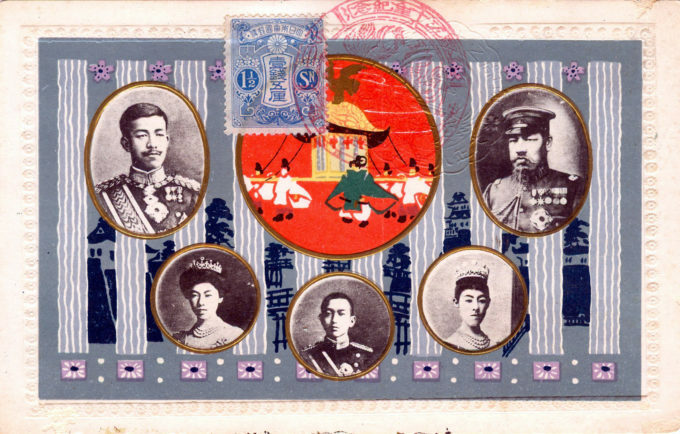 Bottom: Empress Shōken, widow of Emperor Meiji. Left: (unidentified). 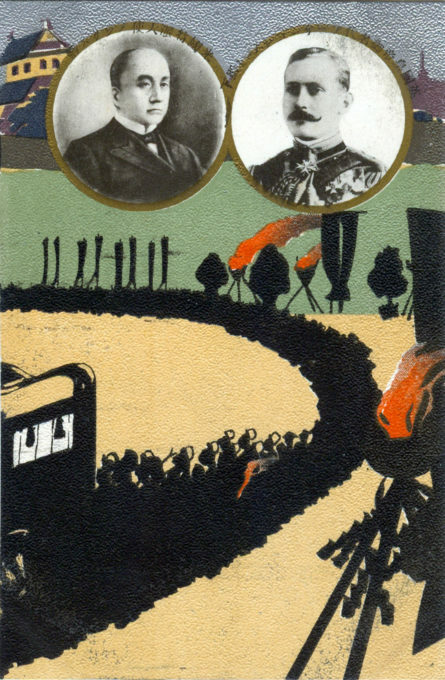 Right: Kaiser Wilhelm II, of Germany. “The tone of voice of the newsboy selling extras was not the animated tone one hears during war time; nor was it the flippant tone characteristic of some trivial event being deliberately overplayed, or the intrigued tone of a political reform. Rather, it was a sad, despondent voice that one heard as the newsboy ran down the street. 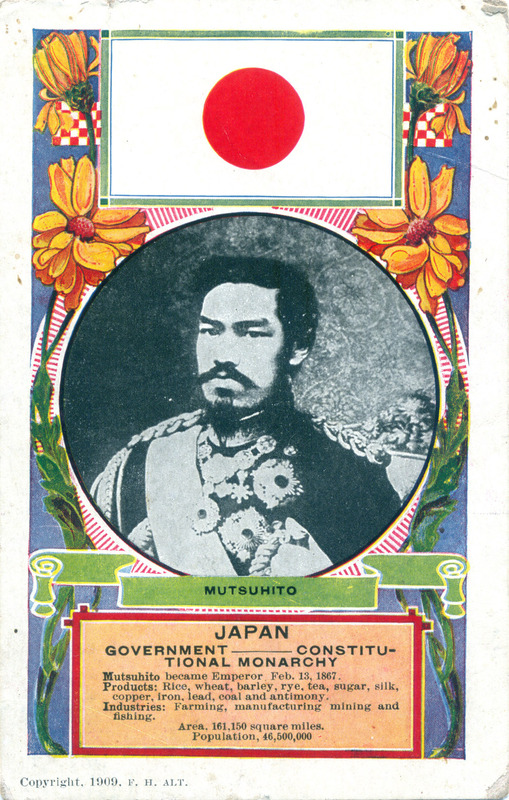 Emperor Meiji, 1909. By the end of the Meiji era, in 1912, Japan was still primarily an agrarian nation but had rapidly developed its industrial might and capacity during Mutsuhito’s 45-year reign. “‘His Majesty’s condition is critical’ … ‘His Majesty’s state of health as of yesterday’ … and then, over the next four or five days, it was reported that crowds had gathered near Nijubashi to pray constantly for His Majesty’s recovery. “The whole nation was stricken with grief. Everyone spoke in hushed tones, with a look of sorrow on their face. “It was impossible to stop nature’s forces entering the Palace grounds and into the very of the Palace itself to where the Emperor lay. The best doctors in the nation were powerless. “Who could fail to be moved to tears by the thought of the illustrious life of His Majesty Emperor Meiji, ‘Mutsuhito the Great’, Lord of the Restoration, who despite being raised in adversity surmounted all manner of obstacles and perils to lead Japan to the state of wonderful international nationhood it enjoys today? “There comes a time when one must bid farewell even to an emperor. It was no just me who felt this. The whole nation felt the same way. 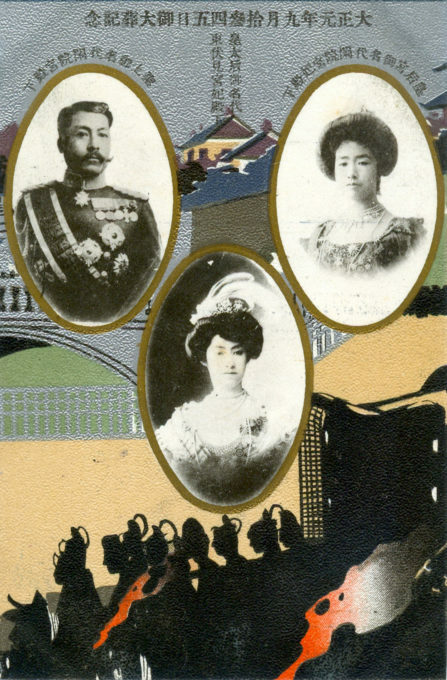 (Clockwise, from upper-left) Emperor Taisho, late Emperor Meiji, widow Empress Shoken, Crown Prince Hirohito (future Emperor Showa), and Empress Teimei, c. 1912. “The Emperor Meiji’s majestic funeral procession marked the maturity of the polity founded upon the Meiji Restoration, and the full achievement both of national independence and of equality with the other [Great] Powers.